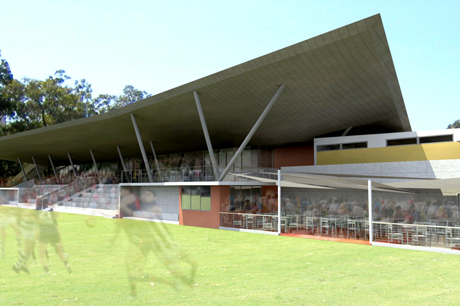 Tom Price is home to more than 20 sports groups, and the Sports Pavilion is a key component of the Tom Price Town Centre Revitalisation program. Football, cricket, soccer, baseball, rugby and softball will all be catered for. 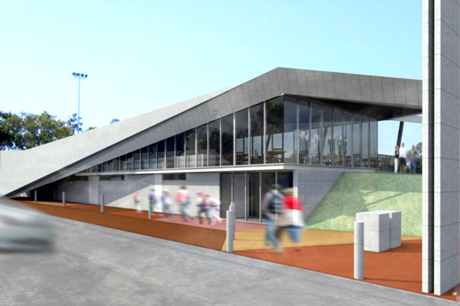 It will also accommodate tiered seating, a bar, kiosk, and function facilities. Through the use of earth banks (natural grandstands) and the large folded roof form, the building looks as though it had pushed itself up from underground to create the necessary shelter. Selected surfaces will feature living walls of bougainvillea and other climbing plants to provide colour and softness to an otherwise hard, red landscape.